Backroad Bicycling in Vermont, by John Freidin. 4th Edition, 2006. 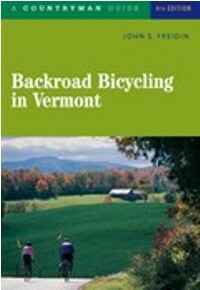 A classic road riding guide by the founder of Vermont Bicycle Touring. The 25 rides range from 7 to 152 miles, with terrain from flat to hilly. Each has a map, a detailed description/mileage log, and info on accommodations and bike shops. 206 pp, 5 ¼” x 8 ¼”.